March 2, 2019 at PayPal HQ in San Jose! Invent Your Future (IYF) Enterprises today announced winners of the 2016 Dare 2B Digital Design Challenge, a cutting-edge program that empowers young innovators in grades 7-10 to solve global problems using Science, Technology, Engineering, Arts and Math (STEAM) skills. 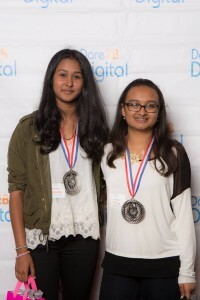 IYF recognized three winning teams at the Dare 2B Digital Red Carpet Design Celebration April 7th at MetroED in San Jose. The event drew a packed audience of Silicon Valley thought leaders, educators and next generation inventors, entrepreneurs, engineers and scientists representing Bay Area schools. Design Challenge teams identified a major challenge in Heath & Wellness, Cybersecurity, Transportation and Environment categories and developed an idea to solve it with guidance from industry mentors. Selected from dozens of entries by a distinguished panel of judges based on creativity, feasibility, and use of STEAM skills, six finalist teams debuted their three-minute solution videos. 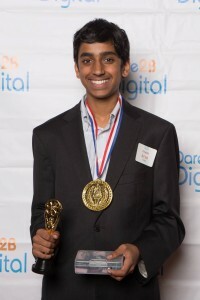 Arya Goutam from The Nueva School developed the idea for a low-cost wearable fall detection device that automatically alerts family members if a senior citizen wearing it falls down anywhere in the world. Daniel d’Abreu Noronha, Alex Chen and Tobias Worledge from Bret Harte Middle School came up with a way to reduce green house gases and dramatically reduce heating and energy bills by combining two ready-made commercial paints that reflect and retain heat. Low cost roofs can be painted with immediate savings on heating bills. Natasha Rao and Priya Vyas of Mission San Jose High School built a prototype of a health and wellness robot called “Cobot,” a “Cooperative Robot” that dispenses medication and connects and communicates vital signs to doctors of senior citizens. They were inspired by “Baymax” the Disney Big Hero 6 Health and Well Being Robot. They felt Baymax was so technologically advanced and pill reminder apps were too low tech, so they innovated a step closer. MetroED, California Career Pathways, PayPal, Deloitte, Oracle Academy, Brocade Communications, GoDaddy, First Tech Federal Credit Union, Accenture and UL. To get involved in upcoming Dare 2B Digital events, call Invent Your Future at 650-592-9227. Dare 2B Digital (www.dare2bdigital.org @dare2bdigital) inspires young innovators to explore STEAM fields through interactive, hands-on learning experiences. Dare 2B Digital is a program of the Invent Your Future Foundation, a 501(c)3 non-profit organization, presented by Invent Your Future Enterprises (www.inventyourfuture.com @IYFNews).